Remember in a recent survey I sent out when we all agreed easy recipes rule? Yeah, me too! 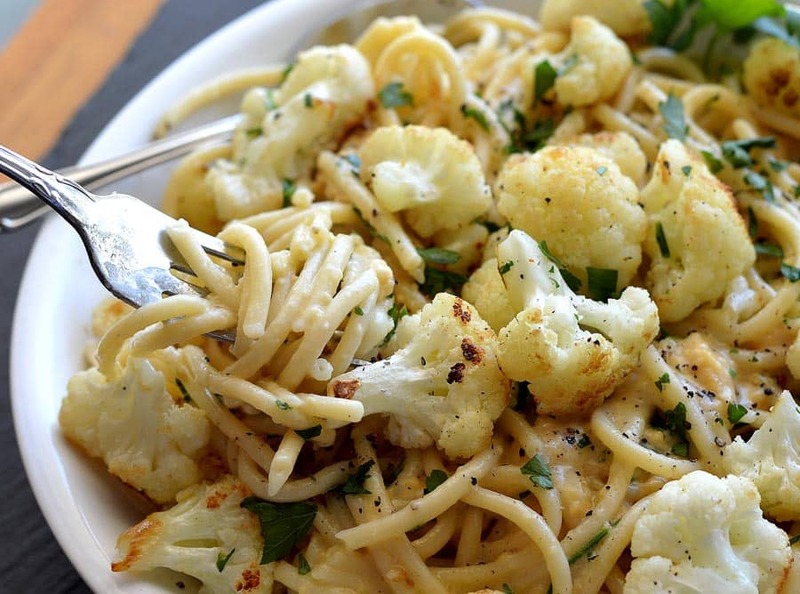 This Pepe Bucatini with Roasted Cauliflower is so simple, yet so incredibly delicious! ‘Pepe’ meaning black pepper in Italian, is traditional in this Italian first course which we’re presenting as a main dish in this recipe. 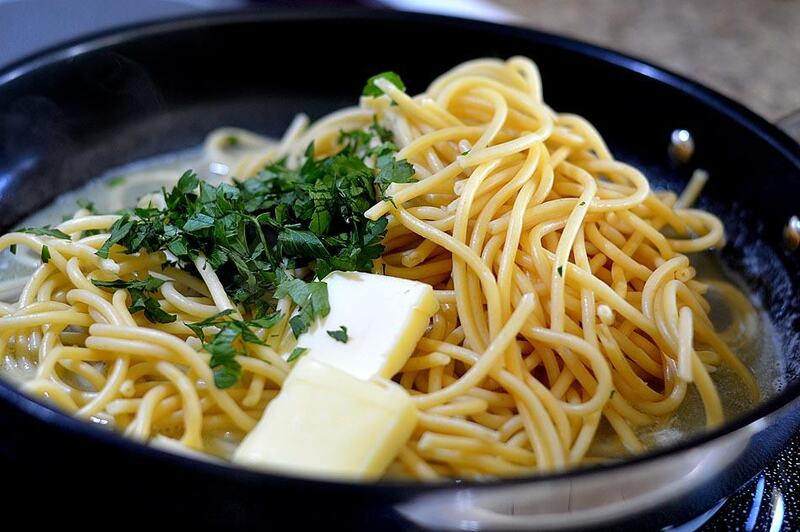 The original Cacio e Pepe used Pecorino Romano Cheese, but I wanted to provide a vegan alternative and available vegan parmesans fit the bill. Vegetarians could also use a mix of Parmesan and Romano for even more flavor. Another not-so-traditional alternative (at least for this dish), would be homemade toasted bread crumbs. Maybe even a little nutritional yeast? 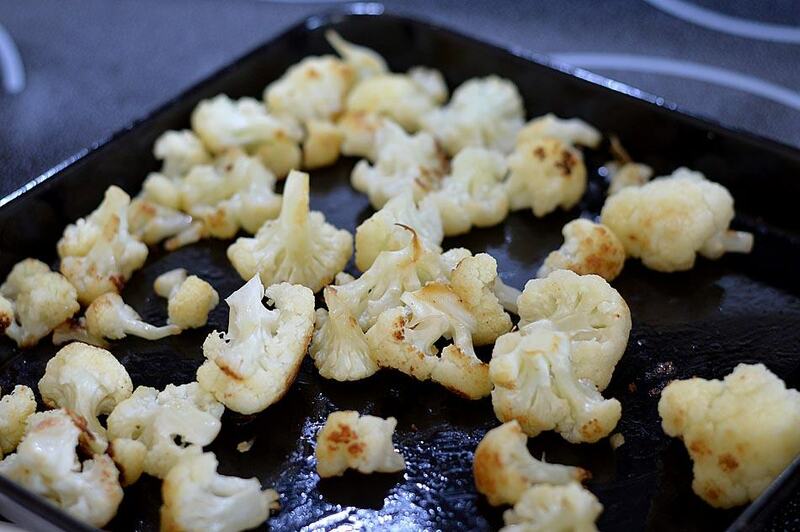 The cauliflower florets are tossed with olive oil, seasoned with salt and roasted until tender and golden brown. Meanwhile, the Bucatini pasta is boiled in water that should be salted enough to “taste like the sea”. Remember that this is really the only chance to get flavor into the pasta and as it absorbs the water, it also absorbs some of that salt. Since this dish is very simple, it’s the attention to detail that matters. Why Bucatini? Because if you look closely, this pasta is hollow in the center allowing the flavors to travel into the pasta. It’s tender, but has some bite. Perfect for this recipe. Before draining, reserve about 1 Cup of the water. 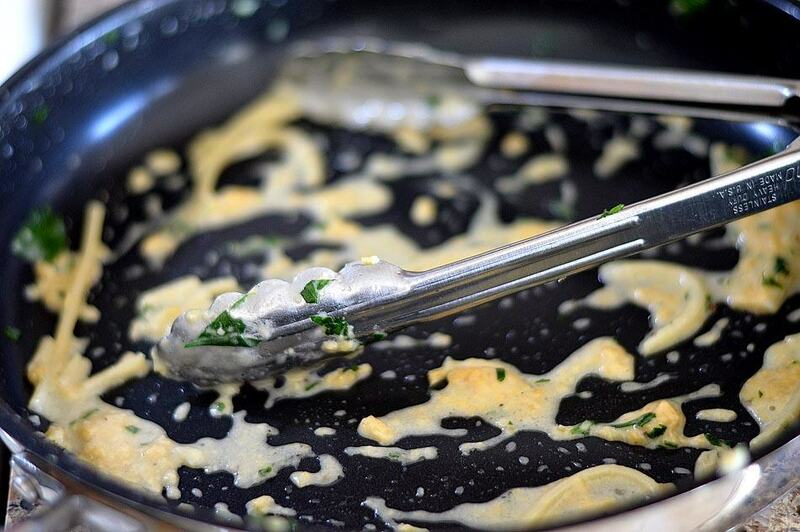 In a large skillet, melt 3 Tbl of margarine/vegan margarine over medium heat. Add freshly coarse ground pepper and the reserved pasta water bringing to a simmer. Add the remaining 3 Tbl of margarine and the pasta. Remove from the heat and add the parmesan/vegan parmesan a little at a time, tossing with each addition to be sure all of the pasta gets coated. This will form our sauce. I love quick and easy recipes like this and I promise to bring you even more this fall. 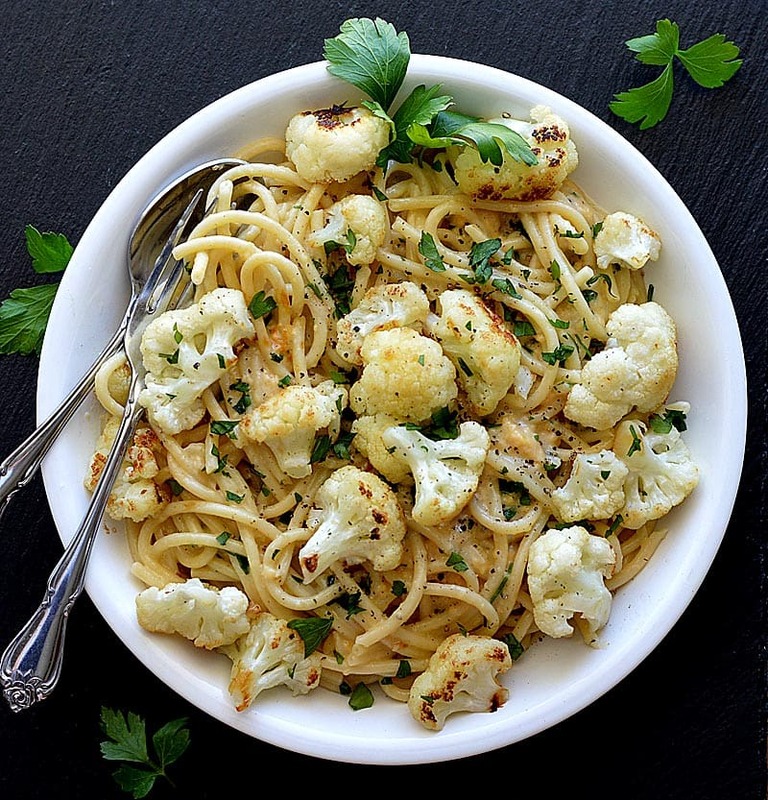 If you make this recipe for Bucatini with Roasted Cauliflower, let your fellow readers know what you thought in the comments section below. Preheat the oven to 450 degrees. 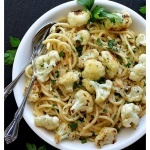 The cauliflower florets are tossed with olive oil, seasoned with salt (hold off on the pepper, that comes later) and roasted until tender and golden brown. Meanwhile, the pasta is boiled in water that should be salted enough to "taste like the sea". Remember that this is really the only chance to get flavor into the pasta and as it absorbs the water, it also absorbs the salt. Since this dish is very simple, it's the attention to detail that matters. Before draining, reserve about 1 Cup of the pasta water. In a large skillet, melt 3 Tbl of margarine/vegan margarine over medium heat. Add freshly coarse ground pepper and the reserved pasta water bringing to a simmer. Add the remaining 3 Tbl of margarine and the cooked pasta. Remove from the heat and add the parmesan/vegan parmesan a little at a time, tossing with each addition to be sure all of the pasta gets coated. This will form our sauce. Add the roasted cauliflower florets and freshly chopped Italian flat-leaf parsley.